The map overlaid here is taken from Handbook for Travellers in Russia, Poland, and Finland, Fourth Edition, Thoroughly Revised, published by John Murray, London, 1888, and geo-rectified using Mapwarper. The original image, reproduced below, is provided courtesy of the UCL SSEES Library. As can be seen from the juxtaposition of the historical and current maps, there have been significant improvements in cartographical accuracy over the last century. Although we had intended to use the John Murray map as the base for our annotations, we found reconciling it to Dostoevsky’s book problematic. In particular, the map of the section of the canal dividing the Spasskaia and Kazanskaia districts, home to Sonia and Raskolnikov and setting for much of the book, was quite distorted. Nevertheless, the original map fullfilled its purpose of guiding visitors around the city, and could probably still be used for such today. 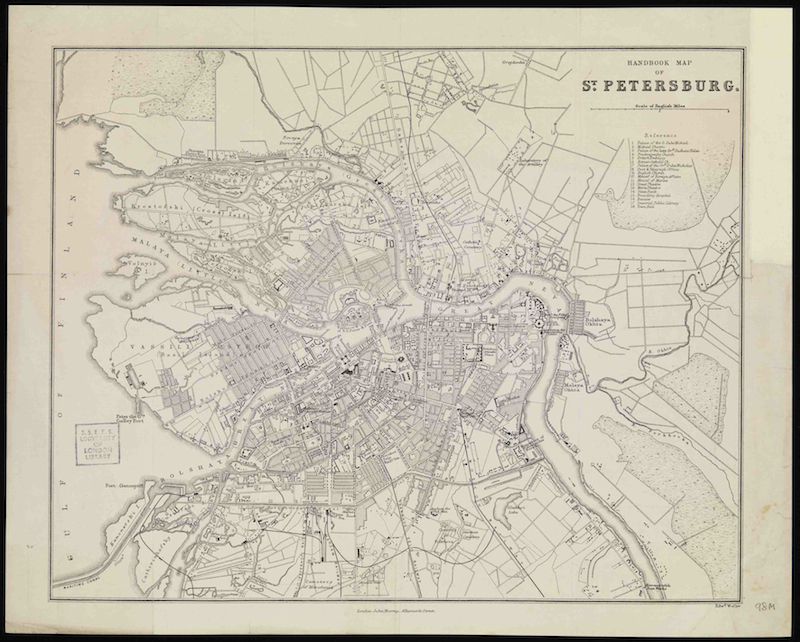 Map of Saint Petersburg published by John Murray in 1888.